One of the unfortunate things about beautiful South Lake Tahoe – it’s no secret. The pool area at Forest Suites Resort at Heavenly Village is a fun, convenient place to hang out any time of day. Visit the beautiful shores of Lake Tahoe in the peak months – summer or winter – and you are likely to find a crowd. That was the case on a recent summer visit to the idyllic vacation spot literally on the border of California and Nevada. But thanks to a stay at Forest Suites Resort at Heavenly Village, our family was able to minimize the crowds. We arrived on a Sunday afternoon and never got back into our car until departing Tuesday afternoon. Forest Suites Resort is perfectly situated. 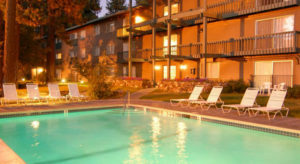 Located a short walk from the beautiful Heavenly Village, there’s no need to utilize the car because so many things are within walking distance of your hotel room – the Gondola to Heavenly Mountain ski resort (which has tons of summer activities), restaurants, shopping venues, casinos, the Lake, supermarket, day-long musical entertainment in the Village, golf course, bike trails, and more. The main attraction at Forest Suites Resorts is its pools – they have two. Our family of three had a suite that couldn’t have been more perfectly situated. Literally 15 yards outside the sliding glass door in the living room was the pool area. Now it’s not a huge pool, but large enough to get a suitable workout in (early morning, late night is best for swimming laps) or simply have some fun with family and friends. The shady trees were ideal for some late afternoon hanging out by the pool or relaxing in the hot tub – which was plenty hot (I hate when the water is only moderately warm) and soothing. There’s tons of outdoor seating at the pool, so no one has to be disappointed in not having a deck chair or lounge chair for sunbathing. There is a gas grille for cooking and lots of tables to eat dinner with a sizable group. In fact, a family reunion was taking place during our stay at Forest Suites Resort that accommodated 40 people! 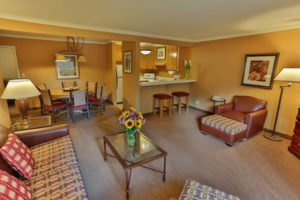 A suite at the Forest Lake Resorts in South Lake Tahoe includes a full kitchen and sizable, comfortable living room. Although the Forest Suites Resort is certainly no fancy hotel, it was very clean, functionable, and if you’re on a budget – affordable. Included with the room was a full breakfast every day, plus coffee and cold water throughout the day in the large, comfortable lobby. Forest Suites Resort has a friendly, helpful staff available if there are any questions regarding restaurants, activities, ect. And the ample parking (there are numerous covered spots) is free! Note that free parking is limited now on the South Shore, where casinos are charging $20. We had a one-bedroom suite that can accommodate four people. My adult daughter said the pullout couch was comfortable and was relatively easy to access. Although we didn’t cook, it was really nice to have a full kitchen (pots, pans, dishes, silverware) and a large refrigerator for storing our cold drinks, fruit, and other cold-storage items we had brought with us. The bedroom had a comfortable queen bed, a large chest of drawers and a closet for hanging and storing clothing. There was also a large chest of drawers in the living room, which I had never seen before in other similar hotels. The bathroom had a nice shower and was large enough that we all could store some items on the vanity. 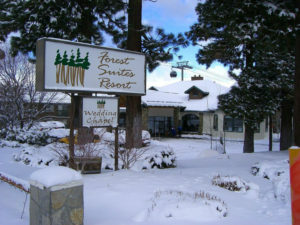 Forest Lake Suites in South Lake Tahoe is situated a short walk to the Gondola that takes skiers and riders to Heavenly Mountain ski resort. One other thing regarding our stay at Forest Suites Resort: We met the nicest people. I became fast friends with the family reunion folks and they invited us to dinner on their last night at the hotel. We also met many other nice families, many of them with kids who were never out of control at the pool and respectful toward other people. We loved our stay at the Forest Suites Resort and will likely return. It’s a wonderful location – summer or winter.